Description: 5.2 mil production painting masking tape is a high adhesion, general purpose masking tape for quick projects or on hard-to-stick surfaces. Also used for holding, bundling, and sealing. Description: 5.5 mil production painting masking tape is a high adhesion, general purpose masking tape for quick projects or on hard-to-stick surfaces. Also used for holding, bundling, and sealing. 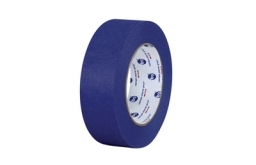 Description: 5.0 mil painter's tape ideal for use on woodwork, cabinets and trim and provides a 5 day removal time. Made with approximately 56% renewable resources. Conforms well around curves and irregular surfaces and works well on semi-smooth surfaces. Description: Consistently removes cleanly without surface damage or adhesive transfer, even on glass exposed to direct sunlight. A versitile, easy-to-use and easy-toremove masking solution where performance is critical. Removes cleanly without surface damage or adhesive transfer. Sharp, clean professional paint lines. 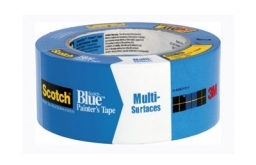 Standard Widths: ½", 1", 1½" & 2"
Description: ScotchBlue™ Painter's Tape Original Multi-Surface can be used on a variety of surfaces, such as walls, trim, glass and metal. It removes cleanly for up to 14 days and does not cause surface damage, even when exposed to direct sunlight. 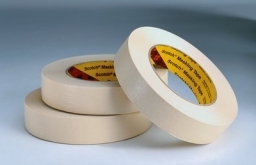 Standard Widths: 1", 1½", 2" & 3"
Description: 6 mil very high-temperature resistant masking tape for use in masking and holding applications where temperatures reach 350 degress up to 30 minutes. Rubber adhesive with crepe paper backing, is very transfer-resistant keeping edge lifting to a minimum. Indoor use only. 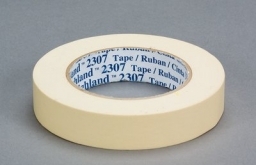 Standard Widths: ½”, ¾”, 1", 1½”, 2" & 3"
Description: 5.2 mil general purpose masking tape used for holding, bundling, sealing, and general paint masking. Tested for compliance with ASTM D 6123 / D 6123M-97. 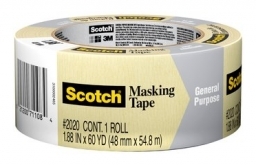 Description: 7.6 mil premium high-performance masking tape designed to perform well in most industrial painting situations, including the use of bake cycles. 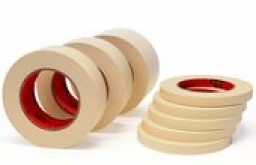 Rubber adhesive with clean removal and good holding power with minimal lifting or curling. 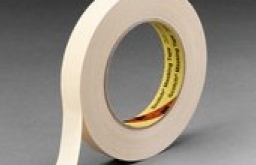 Description: 6.3 mil high performance masking tape designed to be used in medium temperature paint bake operations. Clean removal at temperatures up to 250 degrees. Excellent transfer resistance. 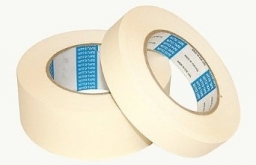 Description: 5.9 mil general purpose masking tape designed to be used in medium temperature paint bake operations. Clean removal at temperatures up to 250 degrees. Excellent transfer resistance. 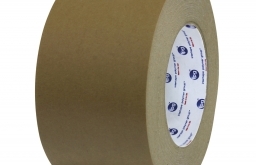 Description: A 6 mil beige, semi-bleached crepe paper masking tape coated with pressure-sensitive natural / synthetic rubber adhesive. Conformable and flexible. Designed primarily for general purpose bundling, protecting, and various industrial applications, interior paint masking, silk screening, mail rooms, golf club shaft (buildup), carpet pad / pad splicing, freezer tape, and for light bundling, packaging, splicing and tabbing. 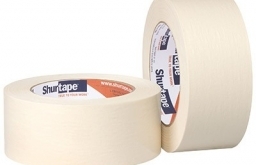 Standard Widths: ½", ¾", 1½", 1", 2" & 3"
Description: A beige, conformable, semi-bleached crepe paper masking tape coated with pressure-sensitive natural rubber adhesive. Capable of withstanding bake temperatures up to 180˚F (82˚C) for up to one hour and/or exposure to ultra-violet (UV) light for up to five hours. Offers consistent conformability and tensile strength for general purpose bundling, protecting, and various industrial applications. 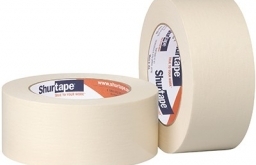 Standard Widths: 1", 2" & 3"
Description: A moisture resistant kraft flatback paper tape with an aggressive, pressure-sensitive natural/synthetic rubber adhesive. Designed to offer a positive, attractive seal and excellent adhesion to minimize carton sealing failures and prevent pilferage. Excellent balance of machine and cross direction tensile and tear strength. Remains strong under moist conditions. Product is not repulpable. 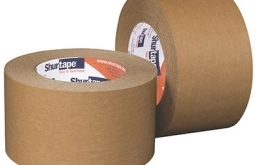 Standard Widths: ¾”, 1", 2", 3" & 4"
Description: A medium crepe paper tape used for temporary harness, wrapping, identification, color coding, edging, and light weight packaging. 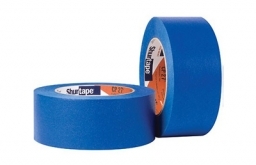 Standard Widths: 3/8”, 1/4", ½”, ¾”, 1, 2"
Description: A 7.3 mil fine crepe paper masking tape with a pressure-sensitive rubber/resin adhesive. Designed for clean removal from a variety of surfaces after exposure to oven temperatures up to 325 degrees F (163°C) for 30 minutes (time and temperature determined by surface). Performs well in wet strip applications. Its easy handling, smooth crepe backing exhibits high strength, excellent conformability to irregular surfaces and exceptional cornering. Provides resistance to paint flaking and a clean, well-defined paint line. 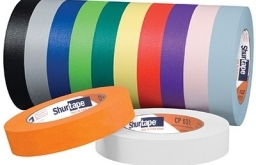 Standard Widths: ½”, ¾”, 1", 2" & 3"
Description: A 6.3 mil smooth crepe paper masking tape with a natural rubber adhesive. 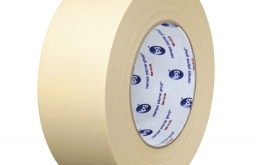 Offers an excellent balance of quick stick, panel adhesion and holding properties. Recommended for most paint masking applications where excellent cornering with clean removal is desired. Will support masking paper aprons at 160°F (70°C) for 30 minutes. Not recommended for outdoor exposure. Description: A 5.8 mil paint contractor industry staple. 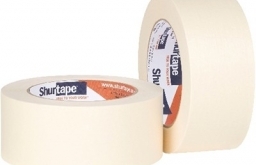 Beige, smooth crepe paper masking tape coated with a pressure-sensitive natural rubber adhesive. 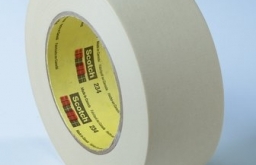 Offers an excellent balance of quick stick, panel adhesion and holding properties. Not recommended for outdoor exposure. Description: A quick, sure sealing, economical, pressure-sensitive flatback tape which can increase packaging line efficiency. PM2 offers a positive attractive seal and excellent adhesion to discourage pilfering. Performs well under a wide range of temperatures through a wide range of humidity conditions. Offers the advantages of a balance of high quick stick and excellent holding properties. 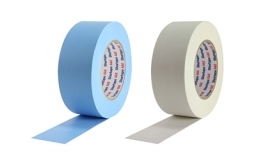 Performs well as a low temperature splicing tape and meets USPS requirements. Product is not repulpable. 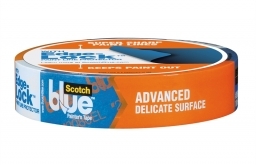 Description: Blue fine crepe painter's tape with a specially formulated pressure-sensitive, synthetic rubber adhesive designed for exposure to sunlight for up to fourteen days. Exhibits easy, clean removal from most surfaces. Excellent conformability as well as smooth backing for superior paint lines and reduced fingertip abrasion. Consistent, easy unwind and resistant to humidity and paint bleed-through. Also has secure adhesion and is stain-resistant. 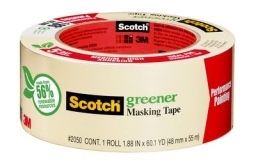 Description: Light green crepe paper masking tape with a specially formulated pressure-sensitive, synthetic rubber adhesive. Designed for direct exposure to sunlight up to eight days. Conformable, consistent, easy unwind. Resistant to humidity and paint bleed through. Secure adhesion with easy, clean removal from most surfaces. Description: Premium kraft paper tape used for color coding and labeling, and is printable with flexo inks, markers, pens, and pencils. Description: 4.9 mil general purpose masking tape, economical and with good performance on a variety of substrates, including cardboard. Good low temperature properties and good for packaging, splicing, holding, bundling, and labeling. 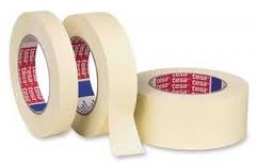 Description: 4.8 mil general purpose masking tape, economical and with good performance on a variety of substrates, including cardboard. Excellent quick stick and good for packaging, splicing, holding, bundling, and labeling. Description: CP 27® removes cleanly from painted walls, trim, woodwork, glass and metal for up to 14 days without damage. Not recommended for use on wallpaper, unpainted wallboard, ceiling tile, or with uncured coatings. 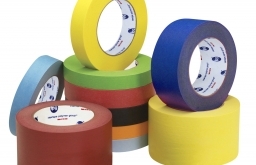 Standard Widths: 1", 1½" & 2"
Description: 4.7 mil medium-high adhesion general purpose masking tape used for labeling, color-coding, decorating, identification, packaging, bundling, binding and splicing. 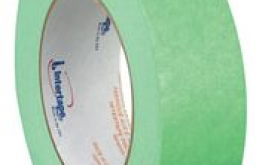 Flexible paper backing provides excellent adhesion/release from a variety of substrates. Approved for labeling of hazardous materials. 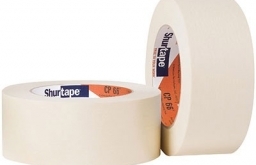 Standard Widths: ¼”, 3/8”, ½”, ¾”, 1" & 2"
Description: 5.8 mil contractor/professional grade masking tape, used for commercial and residential painting and construction, industrial masking, holding, and packaging. Rubber-based adhesive with crepe backing provides good quick stick and good conformity to irregular surfaces. 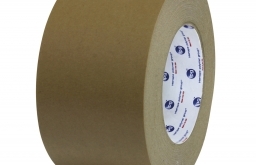 Description: 5 mil very high adhesion crepe masking tape, designed for use in general purpose packaging, bundling, holding, splicing, tabbing and banding applications. Water and oil resistant and provides excellent quick stick, flexibility and ease of use. Standard Widths: ¼”, ½”, ¾”, 1", 1½”, 2", 3" & 4"
Description: With a strong, flexible and conformable backing that has high cross-direction tensile strength, FP 96 is designed for both hand and machine carton sealing and splicing of various substrates. It is also used for general purpose packaging, binding, holding, tabbing, reinforcing, banding and patching of a variety of substrates. 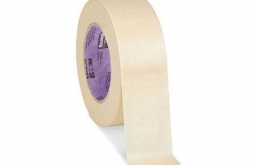 Description: A 5.5 mil high shear crepe paper masking tape with a cured rubber-based adhesive. It provides excellent adhesion to a variety of substrates in a wide range of applications, including light duty bundling, packaging and closing, light duty masking, and painting.